DJI Launches “Campus Stories” Short Film Contest for Students in the U.S.
October 1st, 2016 – DJI, the world’s leader in creative camera technology, has launched its first short film contest, called “Campus Stories,” for all students enrolled in U.S. colleges and universities. With three entry categories, the contest is open to all students, regardless of previous filming experience. The competition provides entrants with hands-on filming and producing experiences with DJI equipment and offers them the chance to win the equipment for themselves. Grand prizes for category winners include some of DJI’s top-of-the-line products, including the Phantom 4, Osmo Mobile, and Ronin MX. Participants in the first two categories (“A” and “B”) will first pitch their campus-themed videos via script. Winners of the pitch contest will get equipment from DJI and the green light to begin producing a three-to-five-minute video on a campus-related theme. 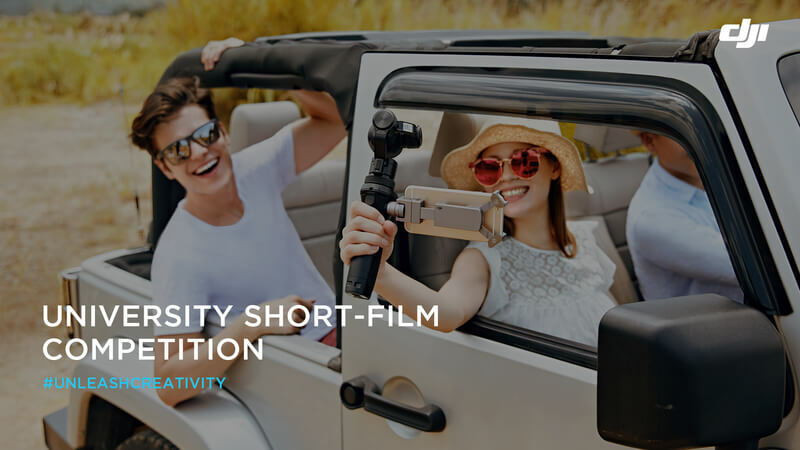 Those entering the “C” category and not seeking any production equipment from DJI will shoot their own three-to-five-minute campus-themed video for submission. Joining the judging panel this year, along with DJI’s own video-production team, are three experts in film production. Tom Antos, creative director of Tom Antos Film, has been featured in Mogul’s Awesome Director Project and his YouTube tutorials have an audience of 260,000. Cherish Chen, creative producer at RocketJump, has worked on big-budget films like “Mad Max: Fury Road” and “The Hobbit,” among others. She is actively involved in RocketJump Film School, which aims to help future generations grow as storytellers and leaders. Mike Bishop is a multi-award-winning filmmaker and leader in creative aerial filmmaking. As a longtime DJI content partner, he has launched videos using DJI’s Phantom drones, the Zenmuse X5 camera and the Osmo stabilized handheld camera. Bishop travels the world, ever raising the bar for quality in this emerging industry. DJI is dedicated to empowering creators with the latest imaging technologies to bring their ideas to life. On campus is where we believe the next generation of creators is. As such, DJI is offering a platform for students to unleash their creativity and talent by telling us their unique campus stories.